A few weeks ago we profiled Stephanie Sloan, freestyle superstar and featured presenter at our upcoming Speaker Series event “Celebrity Athletes and the Growth of Modern Skiing.” The event will explore how professional skiers have harnessed their top-level skills and name-recognition to introduce cutting edge techniques to skiers. This phenomenon has long been a major driving force for the sport, otherwise, we would all still be doing telemarks and stem christies. Here in Whistler, the first high-profile skier to hitch his name and skills to the new resort was Austrian ski-racing star Toni Sailer, who began operating summer ski camps on the Whistler Glacier in 1967. The following year big-mountain ski pioneer Jim McConkey was hired to run the Whistler Mountain ski school. Before (and during) his time in Whistler, McConkey made a name for himself as an early ski film star. Here he is enjoying some of Alta, Utah’s famous champagne pow. Then in 1970, fresh off her historic gold medal performance at the 1968 Grenoble Olympics, Nancy Greene and her husband Al Raine built a cabin in Whistler and became heavily involved in teaching skiing, promoting the sport, and developing the resort. The following image shows the coaching staff at the 1969 Toni Sailer summer camp. Sailer is back row, 2nd from right, and Nancy Greene is front row, 2nd from left. Almost all the other coaches were World Cup level racers. This trifecta of early ski stars set the standard, but there have been countless others over the years. One who has most skillfully made the transition from competition to coaching is John Smart. A moguls specialist John was a two-time Olympian, 13-time World Cup medallist, 3 time Canadian Champion and World Pro Champion during a career spanning from 1987-1996. In 1992 he founded Momentum Ski Camps which focused on training the next generation of freestyle ski champions every summer on Blackcomb’s Horstman Glacier. Today, Momentum is bigger than ever, having fully embraced the Freeski revolution and hosting some of the sport’s biggest names as their coaches each summer. But some might say the real highlight of John’s career came in 2013 when he taught renowned Canadian ranter Rick Mercer how to jump onto an inflatable crash pad. Rounding out the panel discussion will be Rob McSkimming. Rob brings several decades of experience in the ski industry to the table, including a stint as a coach at Dave Murray Summer Ski Camps in the 1980s. 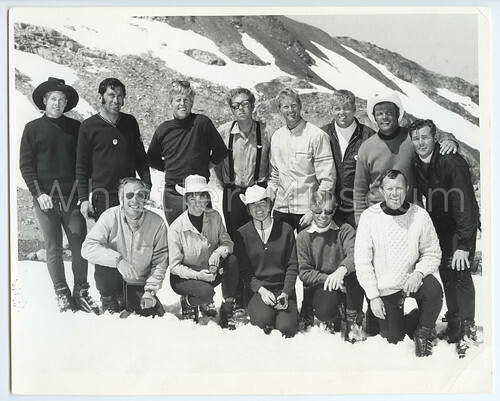 Dave Murray Summer Ski Camp 1987 – coaches group photo. Among many legends of Canadian Skiing pictured here, Rob McSkimming is seated front row, 3rd from the left. Rob went on to become the snow school’s general manager for several years before moving onto his current position with Whistler-Blackcomb as VP-Business Development. Clearly, Rob has a wealth of knowledge that will complement John and Stephanie’s recollections on the panel. We hope you can join us on Sunday February 21st for “Celebrity Athletes and the Growth of Modern Skiing”! The event is being held in conjunction with International Ski History Day, being organized by the International Ski History Association who will have a delegation in attendance. They’re also offering a full-day ski package, concluding at our Speaker Series, that is incredible value. Details available through the above hyperlink. Cost: $10 regular price, $5 for museum members and W-B Club Shred. Summer Skiing? A Whistler Tradition. The sun-filled sky acts as a perfect balance to the chilled mountain air, leading to peak skiing conditions – pun definitely intended. Since the first lifts were installed in the 1960s Whistler has always been was a popular ski destination. Perhaps a victim of its own success, long lineups during the Winter discouraged many impatient skiers, but during the summer this was not the case. Many become occupied with the variety of summer activities available in the Whistler area, such as canoeing on Alta Lake, so the mountain was left to the die-hard skiers. Whistler’s Glacier Bowl was also the only permanent snowfield in Canada that was easily accessible by lifts, a convenience factor which trumped earlier summer skiing efforts powered by helicopters, or simply placing one foot ini front of the other with your ski gear on your back. The first summer ski camps on the Whistler glacier were pioneered by Toni Sailer, a medal-winning member of the Austrian ski racing team. 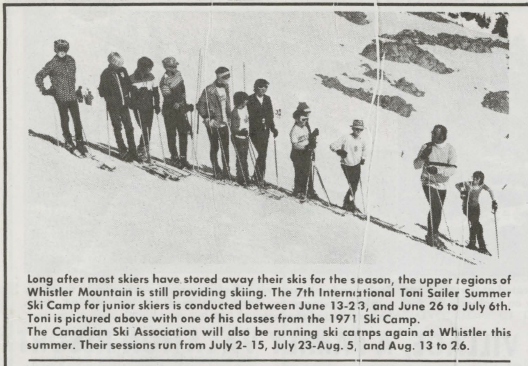 Sailer’s motivation behind developing the ski camp program on Whistler was largely driven by the need for competitive skiers to stay in shape and to improve their techniques between competition seasons, but as word of the camps spread recreational skiers also became active participants. Four types of instruction (Advanced Racing, Intermediate and Novice Racing, Recreational, and Freestyle) became the norm, and accommodated skiers of all levels who received personalized instruction by internationally known skiers such as Nancy Greene Raine, Wayne Wong, and Jim McConkey. 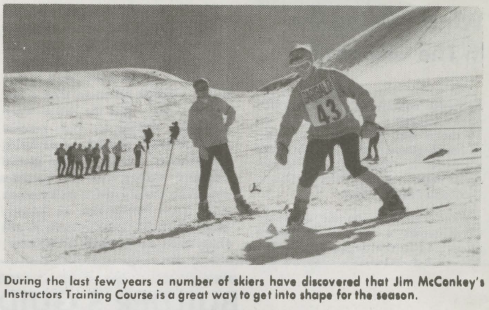 These ski camps inspired many young skiers to enter the competitive world of ski racing, among them being Dave Murray, who attended his first Toni Sailer Summer Ski Camp at the age of 15. Murray quickly rose to fame as one of the Crazy Canucks – the Canadian ski racing team – who took the European-dominated ski racing world by storm with their reckless style of skiing. After 10 years on the competitive ski racing circuit Murray retired to become the director of skiing at Whistler Mountain, as well as the organizer and lead instructor of the summer ski camps. In 1984, the name of Whistler’s most popular summer ski camp was officially changed to the Atomic Dave Murray Whistler Summer Ski Camp, and its fame grew to attract many skiers from Europe and Japan. During the late 1980s the popularity of snowboarding on Blackcomb Mountain was also growing, prompting a need for the development of summer camps that catered to this new breed of mountain rider. The Snoboard Shop Camp of Champions (established in 1989) was one of the first summer camps to cater to snowboarders, and by 2008 60% of Whistler-Blackcomb campers were snowboarders, indicating a mass migration away from camps dedicated to the traditional snow sports. Camps for all types of snow sport – as well as for the newer mountain biking market – have continued to grow in popularity in Whistler as the draw of the year-round glaciers continue to provide excellent conditions for Whistler’s summer ski and snowboard camps.